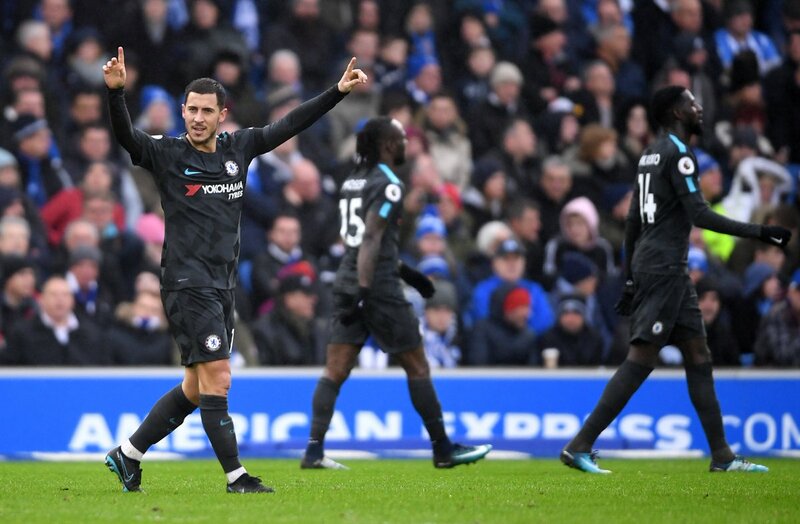 Eden Hazard scored twice as Chelsea moved level on points with Man Utd after beating Brighton & Hove Albion 4-0 at the Amex Stadium this afternoon. It was the perfect start for Chelsea as they opened the scoring in the 3rd minute when Hazard fired home from 12 yards following some excellent footwork in the area. Chelsea then doubled their lead just three minutes later as Willian lashed home a wonderful strike from the edge of the box following some excellent inter-play between Hazard and Michy Batshuayi. Brighton had the chances to get themselves back in the game but couldn’t find a way through while they also had a great shout for a penalty towards the end of the first half. However, Chelsea sealed the three points in the 76th minute when Hazard raced half the length of the pitch, bamboozled the Brighton defence before finding the bottom corner for 3-0. The visitors still had time to score a late fourth as Victor Moses latched on to a superb pass from Charly Musonda to make it 4-0 in the 89th minute as Chelsea moved level on points with second placed Man Utd.